Gets the full content of the article in the source site taken from every feed item permalink. If gets empty full content then takes the original feed item content. Reads complete content for multi-page articles. Gets the featured image from meta tags of source web page, Open Graph or Twitter images. Gets the embeds from youtube, dailymotion, natabanu, vimeo, euractiv, viddler, twitch, toys, facebook.com, etc. Gets the title also from source web page instead of feed. Gets the date of the post from the source web page instead of feed. Gets the author also from source web page and optionally create it if not exist. Option to force CURL access to source site. 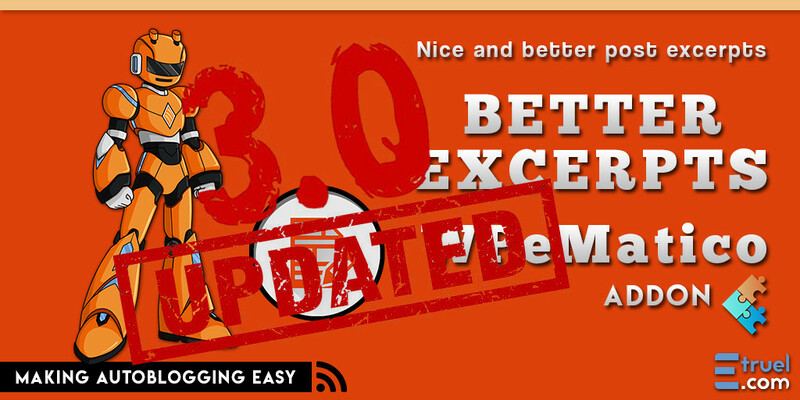 Fixes and corrects wrong HTML content. Includes a config file editor to add support for custom domains. Moves all the config files to a local folder to don’t overwrite the config files when updates the plugin. This add-on takes the title and permalink of every feed item and scratches its web page to find the full content. You can activate each feature on every campaign individually. You can enable this in the txt config file, when you are getting the content through Full content feature. It’s using ‘Tidy’ to fix the incorrect HTML code. Lets you specify exactly what is the full contents of every site of origin. 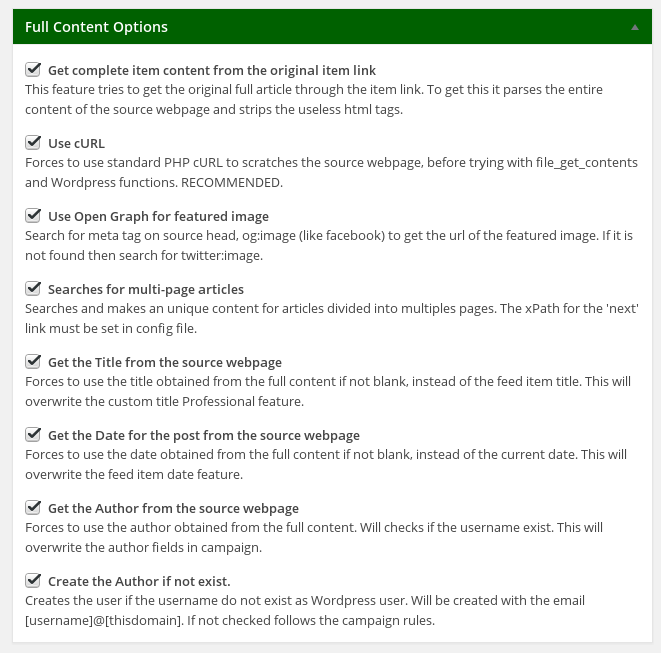 If you want to setup exactly how and what take for the specific content of source page, now you can do it from your wordpress admin from almost any webpage you want the content. WPeMatico Full Content has a folder inside, with configuration files for every website that it’s taken full content. You can add and edit these files but if you upgrades the plugin, these files are lose or replaced again and you must re do the work. WPeMatico TXT Editor allows you to change the configuration files to the uploads folder to keep your files and changes when you upgrade the plugin. WPeMatico will see this folder automatically after it was created and will begin to use these configuration files from your preferred websites for fetching content. But this is not the best! Also adds a file editor that allows test the content obtained from remote domains on the fly. 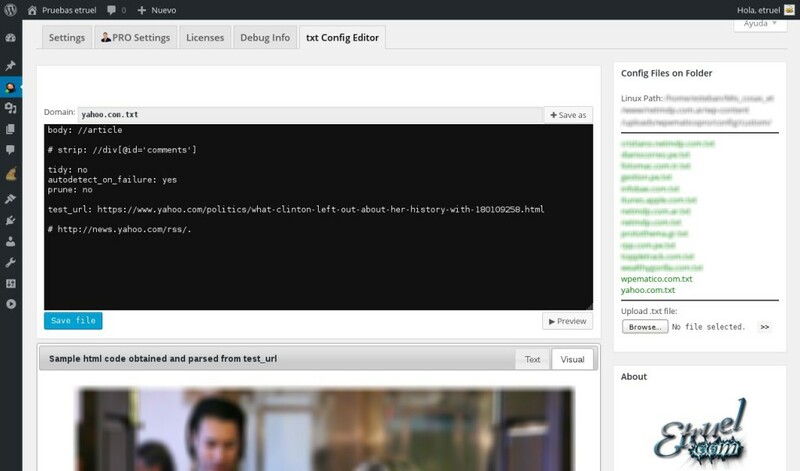 Perform a preview of the full content that you will get for the posts, while editing the config file! You will see how the plugin will fetch the remote site content in your posts while you are editing the config file, then you could get the content from websites that the plugin can’t recognize the article content for itself. Just click on Preview button and will get the content below in Visual mode (As your post will be seen) or in Text mode (as HTML code). 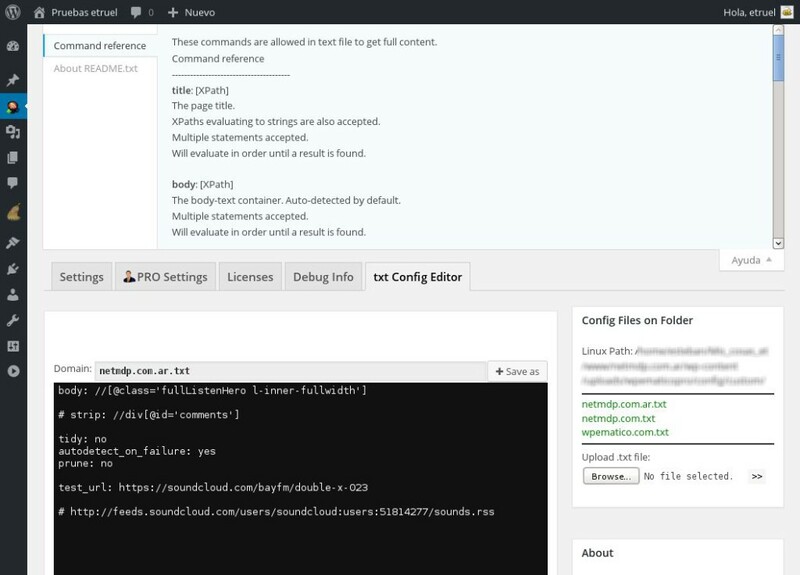 Also have the Inline Help as WordPress style with some tips and all the commands you will need to edit the config files.